For 2019 Michael Burgess will consider great works of art in the National Gallery in London, reflecting, where possible, any major theme of the month. The National Gallery at Trafalgar Square in London houses one of the finest collections of European paintings in the world. Built in the style of an ancient Greek temple, it is home to 2,300 works spanning the centuries of artistic creation. During this year we shall be journeying through the gallery to explore one of those treasures each month. We begin in this month of January as we celebrate another journey: the three kings or wise men travelling from afar to offer their gifts to the Christ Child. Botticelli painted this scene of ‘The Adoration of the Kings’ in 1470-75. 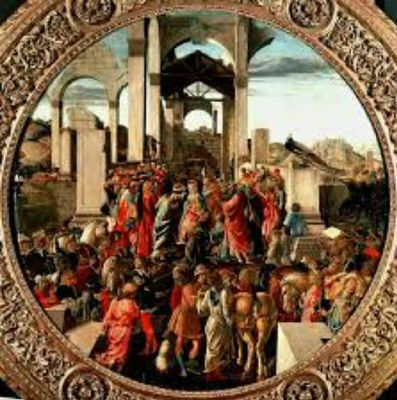 It is one of five depictions he made of the Epiphany, for he belonged to a city, Florence, which had a great devotion to the wise men. Their feast was celebrated each year with spectacular processions. Having entered the temple of the National Gallery, our eyes notice first of all that the temple in this painting is a ruin. It harks back to a legend that the classical temple of peace would only stand secure until a virgin gave birth to a child. In the centre of the tondo we see the Holy Family with Mary holding her new-born son: a sign of the new church that will grow and flourish out of the pagan ruins. That still centre of new life is surrounded by the three kings and a large crowd. We can see horses as well, and a peacock, a Christian symbol of immortality. Amid that panoply of animals and people, we might even see ourselves coming with the kings to offer our gifts, and to find, like them, hope and light in the birth of Mary’s child. Around the scene a new day dawns – it is the light of God’s glory that can shine on us and on our world in this new year of His good grace.